Caption slip reads: "Photographer: Gaze. Date: 1953-12-01. Reporter: Gaze. 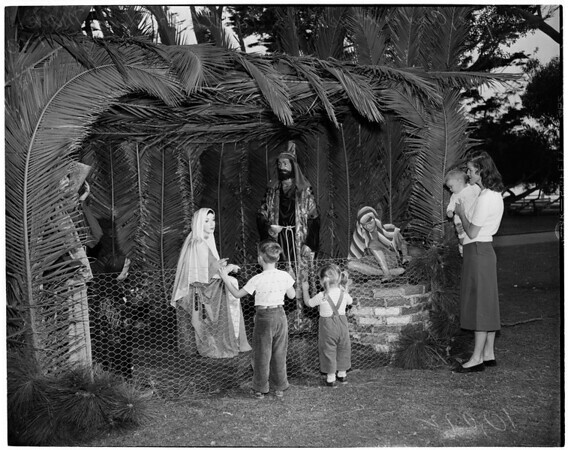 Assignment: Santa Monica nativity. 11-12: Previewing one of the Christmas Story tableaux unveiled tonight (Tues.) in Palisades Park are Mrs. Wendell (Connie) Ventuleth and children, Mark (in her arms), Wayne and Cindy. Title of this tableaux is 'Announcement to the Shepherds.' 81: Same idea with Wayne, cindy and Mrs. Ventuleth with Mark at another of the 9 tableaux."